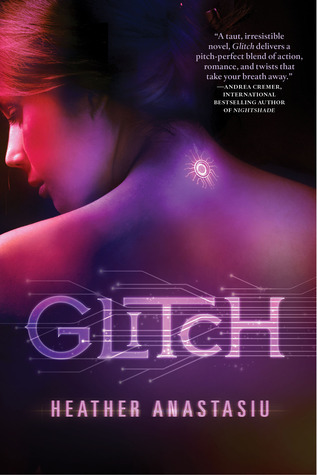 Glitch (Glitch, #1) by Heather Anastasiu. Audience/Genre : Young Adult/Dystopia, Paranormal (?). In the Community, there is no more pain or war. Implanted computer chips have wiped humanity clean of destructive emotions, and thoughts are replaced by a feed from the Link network. When Zoe starts to malfunction (or "glitch"), she suddenly begins having her own thoughts, feelings, and identity. Any anomalies must be immediately reported and repaired, but Zoe has a secret so dark it will mean certain deactivation if she is caught: her glitches have given her uncontrollable telekinetic powers. As Zoe struggles to control her abilities and stay hidden, she meets other glitchers including Max, who can disguise his appearance, and Adrien, who has visions of the future. Together, this growing band of glitchers must find a way to free themselves from the controlling hands of the Community before they’re caught and deactivated, or worse. Zoe lives in a world where order is everything. Right from when a child is born, up until a person dies/is de-activated, everything he/she does with his/her life is mapped out and decided by a chip that's controlled and monitored by the Regulators. But Zoe has a secret - she's an anomaly. She has been 'glitching' a lot the past few months, which means her Link gets disconnected frequently. Although it's only temporary, Zoe literally lives for those few 'glitched' moments when she's aware of everything around her and feels things she has never felt before. If the regulators find out about her glitch, they'll re-program her chip, or worse, de-activate her. I've had Glitch on my wishlist since way back in 2011, so obviously when I saw the digital ARC on NetGalley, I was jumping up and down. However, I'm seriously sad to say that it was painful to get through this book. I hate writing negative reviews, I don't see the point of them but in this case, I have to say it - Glitch was all over the place. To begin with, I'm not sure if it's supposed to be Dystopia or Paranormal. Actually, I'm not sure if even the author knew that. Glitch starts out pretty slow but I took the liberty of assuming that it would get better and forced myself to keep reading. Stupid me, I should've just given up. Although the world seemed interesting at first, it wasn't well formed. It was like the author tried going for the standard dystopian plot (believe me, it would've been a lot easier to read if she had done that) but decided a few chapters in that she had to do something different and gave the characters super powers. Oh and the characters! Don't even get me started on them. Zoe was tolerable but every time Adrien said 'Crackin' Hell' I wanted to bang my head against the wall because I couldn't shut him up. At first, I thought the Zoe-Adrien insta-love was pure torture but that was until I met Maximin (I'm not even going to comment on the name). He was much worse. Max is clearly a boy 'ruled by his hormones' and I don't mean that in a good or funny way. "Can I look at your genitalia?" Yeah. He actually said that. At first I thought I read it wrong, then I hoped I read it wrong but nope, I couldn't even get that one tiny thing going for me. I mean, who says stuff like that? I understand where he's coming from but I thought the whole point of being disconnected from the link was that you get to feel all these emotions and that would give you the sense to talk like a normal person. I couldn't decide if I should laugh or bang my head against the wall again. Max is also apparently in love with Zoe. This is definitely one of the worst love triangles ever. Wait, let me re-phrase, this is definitely one of the worst romance I have ever read about. But clearly, that wasn't enough to make me like this book. Like I said, there were some interesting ideas but I just didn't know which direction the story was heading. It would've worked if the author had just picked one and stuck to it but sadly, that wasn't the case. I'm once again sorry about my negative review. If I hadn't forced myself to read the entire book, I wouldn't have been ranting so much here but I gave it fair shot. Maybe if you haven't read a lot of dystopia, you might like this. On the other hand, I had a lot of expectations for Glitch and I was hugely let-down. I'm glad I'm not the only one, to be honest. Glitch was a huge disappointment to me too, since I was waiting for it for quite a long time. And just as you said, it's all over the place. And that quote made me CRINGE when I read it! I mean... really? Wow. HAHAHAHAHA CAN I LOOK AT YOUR GENITALIA? Can someone get more clinical than that? Sorry to hear that this didn't live up to expectations. I've had it on my wishlist for awhile too, so this is very disappointing. Hope your next read is better! oh! the cover looked so promising :( another eg of why we shudnt judge a book by its cover...thanks for the honest review! Wow, that quote was terrible! I welcome negative reviews, thanks for your honest opinions. Deh. This was one of the dystopians that I looked at and just wasn't sure about.